Their seemingly impossible escape after being trapped for 17 days deep inside the flooded Tham Luang cave in northern Thailand captured worldwide attention. 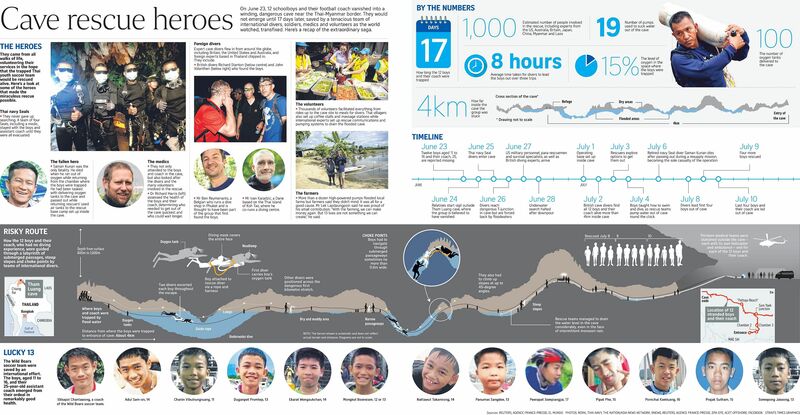 But little is known of the 12 boys and their coach who went exploring in the cave on June 23, only to find themselves trapped by monsoon floodwaters. The Wild Boars youth football team were finally rescued from the cave this week after a massive international effort. Here is what is known about the boys. He was born in Myanmar's Wa State, a self-ruled region that is not recognised internationally. The left defender is one of the four members of the team who are stateless ethnic minorities in Thailand. At age seven, Adul left behind his parents and slipped into the country so that he could get an education, AFP reported. He was raised in a church by Christian teachers. Adul speaks four languages - English, Burmese, Thai and Chinese - and was the only one who was could communicate with the British divers who first found the group. Through him, the group told the divers they wanted food and learned how long they had been in the cave. According to The New York Times, he is the top student in his class. He gets free tuition as well as a daily lunch because of his academic record and sporting prowess . Also known by his nickname Titan, Chanintr was the youngest boy in the group. He began playing football since age seven and was a member of his school's sports club before being asked to join the Wild Boars where he plays in forward. His father told CNN that he last spent time with his son watching a World Cup game on television before his son and the team became stranded in the cave. In a letter to his parents during his time inside the cave, Chanintr wrote: "Please take me to eat fried chicken after this. I love you." Duganpet, also known as Dom, was the team's striker and captain, the BBC reported. He is said to have been scouted by several professional Thai clubs. His head coach Nopparat Kantawong said he was a motivator and respected by his team-mates for his football skills. His note to his family said he was "fine but the weather here is a little cold". Nicknamed Bew, he is the team's goalkeeper, reported the BBC. In his letter to his family, Ekarat promised his parents, who worked as shopkeepers, that he would "come back and help you sell your stuff". 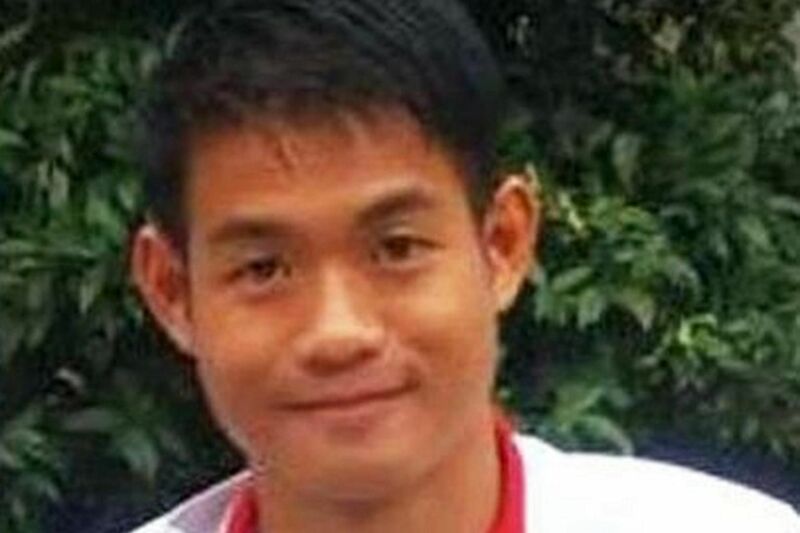 Mongkol, nicknamed Mark, has been described by his teacher Bunjob Chai-arm as a very "very respectful"boy, the BBC reported. He moved from Myanmar to Thailand with his mother and is on the same volleyball team as Adul. His father Thinnakorn said his son is a "good boy" who loves to study almost as much as he likes football. Better known as Tern, he went to the Mae Sai Prasitsart school attended by six of the boys. He wrote in his letter to his family that he missed his parents and grandparents. "I miss you mom and dad. Don't worry about me. I can take care of myself." Panumas, or Mig, plays as defender. Though bigger than other kids his age, his coach Nopparat told the BBC he is agile. In the letter to his parents, he told them not to worry. "The Navy Seal brothers are taking care of us very, very well," the Daily Mail reported him as saying. Nicknamed Night, it was Peerapat's birthday the group were celebrating when they entered the cave. The boys reportedly brought along snacks to their cave outing, which turned out to be their only source of food for 17 days. His sister told AFP the family had prepared a birthday cake for the right-winger along with grilled pork to celebrate with him that night. A member of his cycling club, Sittthisak Sawanrak, told the BBC he was quiet but "a great lad who just loves to cycle and play football". Pipat, also known as Nick, wrote in his letter to his parents and little sister that he loved them, adding: "If I get out please take me to a pork barbecue place." Pornchai, or Tee, plays as defender for the Wild Boars. In his note to his parents, he urged them not to worry, adding he was "very happy". Friends and family of Prajak, better known as Note, described him as smart and quiet, BBC reported. A sports fan, he supports the Thai Premier League's Chiang Rai United football club. Somepong, or Pong, is described as a "cheerful boy" by his teacher Manutsanun Kuntun, AFP reported. He likes sports and football and dreams of becoming a footballer for the Thai national team. He is the assistant coach of the team and the only adult with the boys during their ordeal. His Facebook page features dozens of videos and photos of him with the boys. He often took the team on adventures, cycling up mountain roads or swimming in waterfalls, the Associated Press reported. A member of the stateless ethnic Shan minority in Myanmar, his aunt, Tham Kantawong told The Straits Times that he entered the Buddhist monkhood after losing his parents at age 10 and left at the age of 20 to live and care for his ailing grandmother in the border town of Mae Sai. Another of his aunts, Amporn Sriwichai, described him as a "really good boy" who is "very helpful" and "loves soccer." Thai Navy Seals have credited him for helping to keep the boys alive and calm by teaching them to meditate to conserve their energy. He also provided them with sustenance by telling them to drink water dripping from the cave's walls and forgoing his share of what little food the team had. Before they were rescued, Coach Ekkapol wrote a letter to the boys' families promising to take "the very best care of the kids", to which they responded in a letter saying: "Don't blame yourself." He splits his time working as a temple hand at a monastery and training the Wild Boars. According to the Washington Post, he helped head coach Nopparat devise a system where the boys would be rewarded with soccer gear if they did well in school.